Well, still no new pictures...and no one actually responded to my question, so consider the Photoshop idea dead. If there's some sort of public outcry later, I'll consider reinstating it. Until then, back to random images! 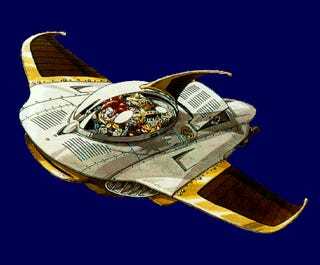 So, I was trying to come up with a topic for today, and as I was browsing through Google images, I found a spaceship looking design. Not the one above, but similar. It got me thinking about my favorite video game vehicles. After thinking about it for a little bit (less than a minute) I decided that, for pure nostalgia's sake, that my favorite video game vehicle was the Aero-Dalton Imperial! I don't care what anyone else says. That's its name because it's AWESOME. Seriously, that Dalton guy was on to something. Anyway, with that being said, it's my favorite video game vehicle because not only can it fly, but it can also travel through time. Also, you can sacrifice it to easily beat the first form of Lavos. Then again, why would you do that? It's too awesome to waste for that purpose. So, tell me fellow TAYers. What are your favorite video game vehicles. I want to know! Share in the comments below! Or talk about whatever. It's all good. Don't forget that the Kickstarter for our very own Habboi's A Hat in Time is still going strong. It only has a few days left and has passed the $200,000 mark! If you haven't already contributed, I strongly urge you to do so! The game looks amazing, and we want to make sure he has so much work to do that he can't post here anymore! Continue the conversation over at TAYCLASSIC where I saw you earlier. Well, earlier for me. Later for you. I do have the Epoch...er...Aero-Dalton Imperial after all. Once you start travelling through that wibbly wobbly timey wimey mess, it gets a little difficult to keep track of when you have and haven't already seen people.